In an interesting stroke of fate, lightning struck twice at the same place. And that's how it was with all that pampering I'd been getting at Holiday Gym and Spa. 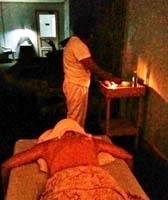 A second round ensued this time with tradition-honored Pinoy Hilot Massage with Body Scrub and a Foot Scrub. (Sep 22, 2016) Pinoy Hilot is the traditional Filipino massage as practised in the rural sections of the country by local shamans, healers and massage therapists. Like Swedish Massage, Pinoy Hilot uses oil and a lot of muscle kneading. 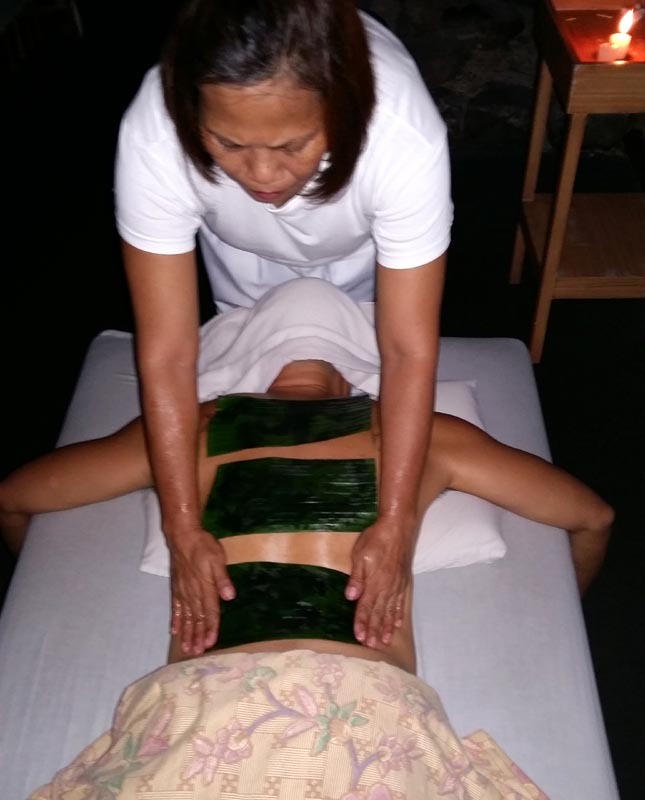 But unlike Swedish Massage that uses 'hard' gliding strokes with limb stretches, Pinoy Hilot employs a thorough light pressure thumbing-through the matrix of the body - square inch after square inch. There are no body stretches but it uses heated banana leaves applied on the back to absorb the unwanted 'cold' that has been trapped inside the body. Although ideally suited to older people, you could ask for a harder version if you want a 'beaten to a pulp' after-feeling. Josephine was thorough and meticulous as my therapist. (Sep 29, 2016) As if life wasn't tough enough, I get the final treatment - the foot scrub. First, my foot was soaked in warm solution to soften the tough calluses. Then, Leyra, my therapist, using a foot file, filed away the calluses for that consistently smooth texture. Like the body scrub, a seaweed exfoliant was rubbed into my foot to clear away dead skin. This was followed by a soothing foot massage with a liniment balm. 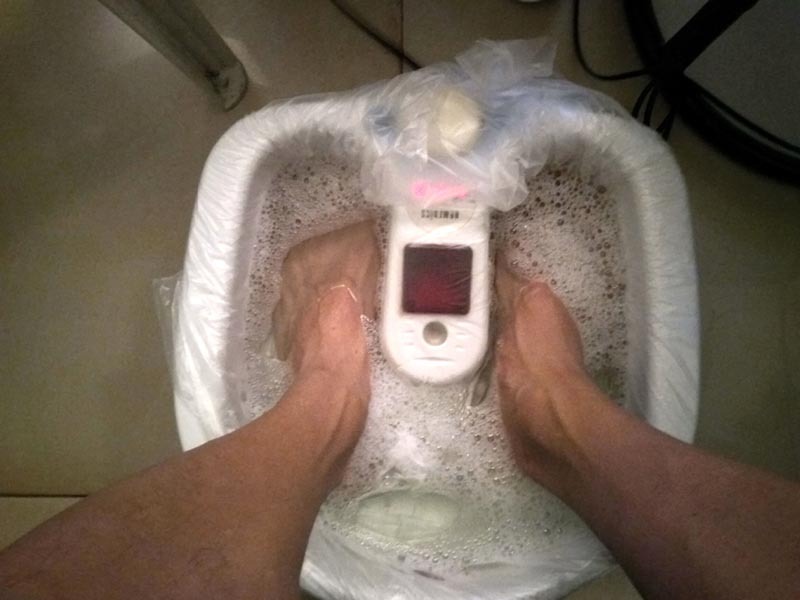 What makes this treatment special from other providers is the added foot reflexology - applying pressure on reflex areas that are connected to various internal organs via the central nervous system. This optimizes the organs and nerve functionality for added vitality. All the treatments are wonderful and professionally administered. I cannot even go heads-or-tails on which is better. However, I noticed that I get the most relaxation if I do my yoga first, followed by sauna and then the soothing massage. That combination should be taken as an integrated whole. It's a pleasurable fix I don't mind getting addicting to. ps - If you want me to write about your massage/spa treatment, email me. Urban Living Zen Hotel - newly opened - all NEW! Copyright © 1999-2016 TheLoneRider.com. All rights reserved.